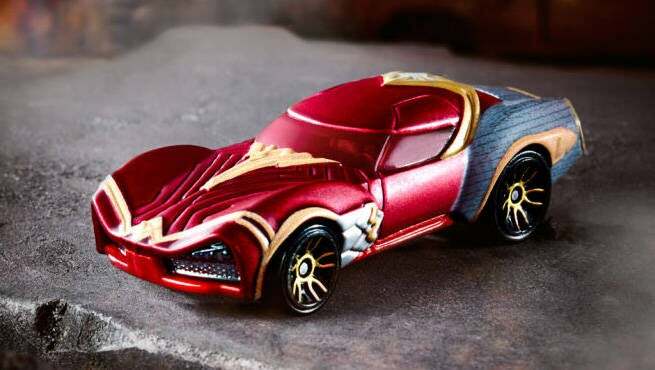 Hot Wheels has debuted a new set of superhero and Star Wars themed specialty cars in honor of Women's History Month, and they are stellar. The set includes cars based on Wonder Woman, The Wasp, Maz, and Black Widow, and each one is designed after the characters most recent or most recognizable costume. The Wonder Woman car is based on her upcoming Batman V Superman: Dawn of Justice appearance, and is fiercely designed, with a red tinted windshield and aggressive lines on the hood. The car packs as much punch as Diana does, and I love how they integrated the tiara into the design. On the complete opposite side of the spectrum is Maz Kanata's car, which echoes the same lovable large-eyed face seen in Star Wars: Episode VII The Force Awakens. Personally, I think this might be my favorite, and it even has two small vents with a line underneath, basically giving it a nose and a mouth. It's kind of adorable. Not to be overshadowed though is Black Widow's car, with its sleek design and added gauntlets on each side mirroring her latest look in Captain America: Civil War. Finally, we have Ant-Man's Wasp, which arcs in the middle, with ice white wings sitting at an angle on top of the car. Even the back wheels are propeller-like, with everything on the car giving the perception of flight. All of the cars can be seen in the gallery, and will be available at retail stores soon.